“Female Voices from the Bible” from Christian Faith Publishing author John W. Crawford is a book of rhyme and free verse about the accomplishments of various female protagonists found throughout the Bible. “Female Voices from the Bible”: a celebration of women in Scripture. “Female Voices from the Bible” is the creation of published author John W. Crawford, a retired educator of high school and university students who has previously published academic works on Shakespeare and the Renaissance as well as three books of poetry. Published by Christian Faith Publishing, John W. Crawford‘s new book is an inspiring book honoring female characters and their contributions to the history of faith in the Old and New Testaments. View a synopsis of “Female Voices from the Bible” on YouTube. 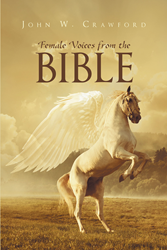 Readers can purchase“Female Voices from the Bible” at traditional brick and mortar bookstores, or online at Amazon.com, Apple iTunes store, Kobo or Barnes and Noble. For additional information or inquiries about “Female Voices from the Bible”, contact the Christian Faith Publishing media department at 866-554-0919.